and tweaks to this recipe over time, and I’ll let you in on those little secrets too! Pretty much since my kids have been teens, this is the cake they request for their birthdays when we’re together. This cake has the best flavor. It’s simple to put together, yet the presentation is elegant. Secret #1: If I’m in a hurry, sometimes I’ll use a cake mix. I prefer Betty Crocker Triple Chocolate Fudge, or if that’s not available I like Duncan Hines Devil’s Food. See the recipe to see the quick change I make by adding sour cream. This gives depth to the flavor and a more moist texture. Although I’m a fan of some cake mixes, I don’t like canned frosting. Make sure you stick with our frosting recipe for a show-stopping dessert. 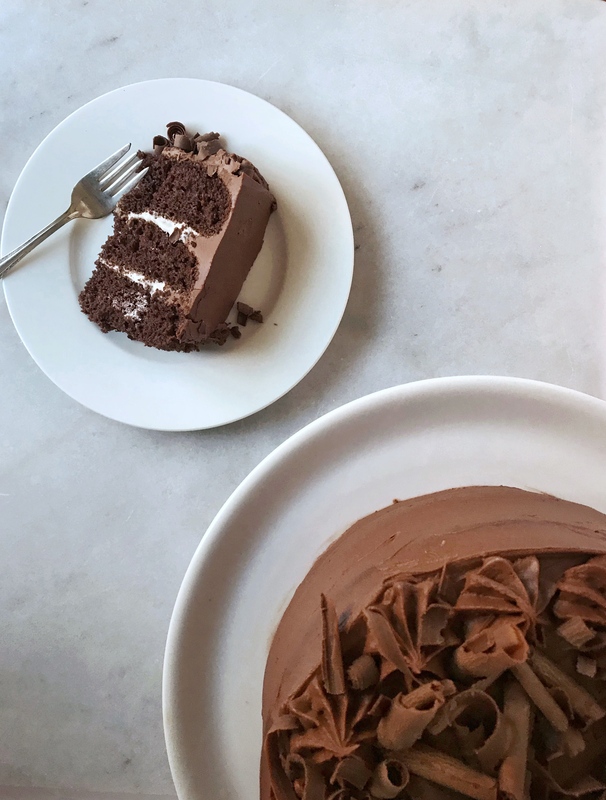 Secret #2: Our “secret” to making this frosting quick is to use a food processor. 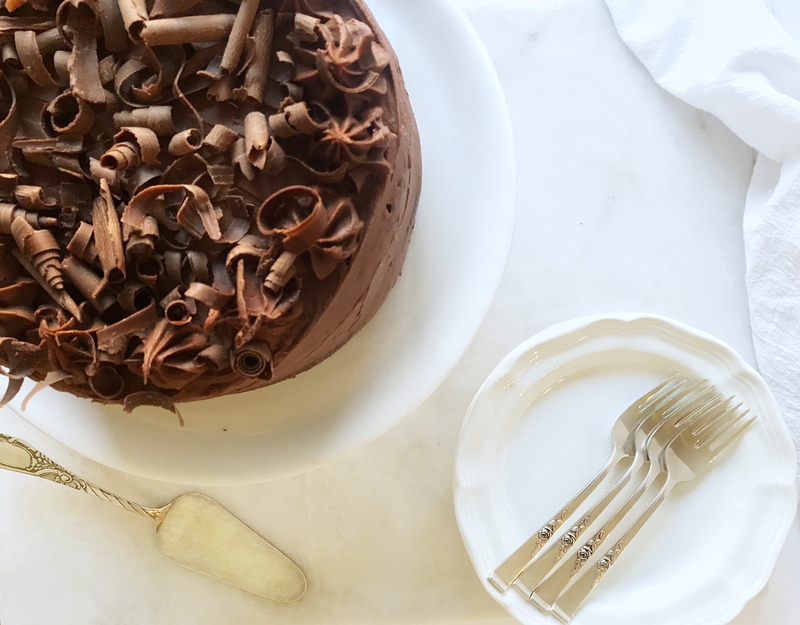 See the recipe for details on making this frosting in less than five minutes! The secret is to have your butter sizzling HOT. 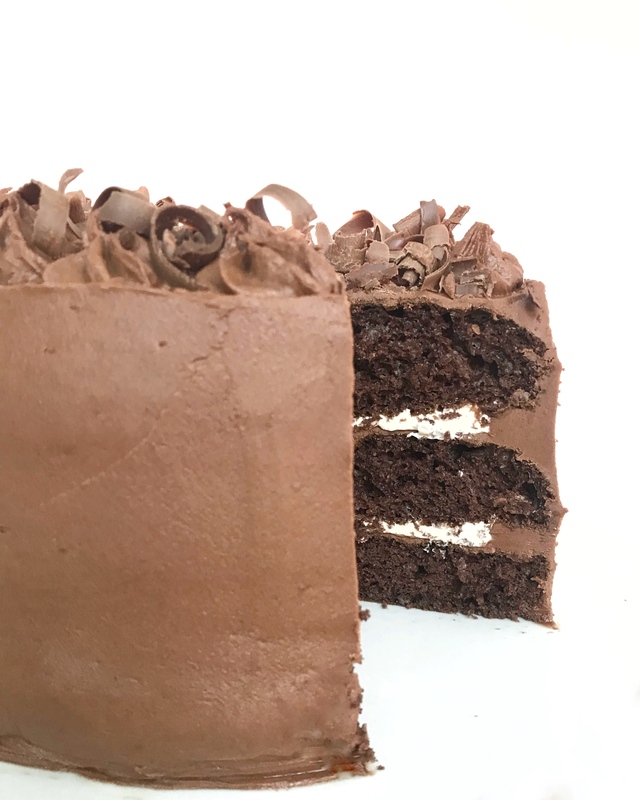 Secret #3: My favorite way to make this cake is to frost each round with a thin layer of fudge frosting, then add a layer of whipped cream over the frosting. I do this for the two inside layers but not on top. For some people this is too much, so just stick with the original recipe. For me, the extra fudge frosting is divine! 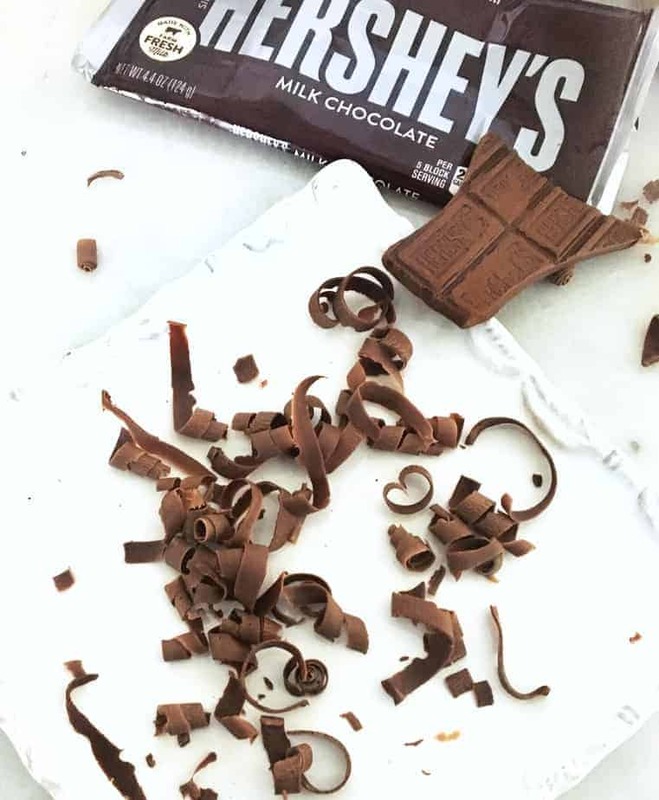 It’s easy to make chocolate curls with a vegetable peeler and a large Hershey bar. The candy bar should be room temperature to dig the peeler in a bit and pull down a curl. Most often I scrape the peeler down the sides for a medium sized curl. Experiment by dragging the peeler with a broad stroke across the back of the bar for a wide curl. Or scrape the peeler down a corner for a narrow spiral. I love the combination of different sized and shaped curls atop the cake. 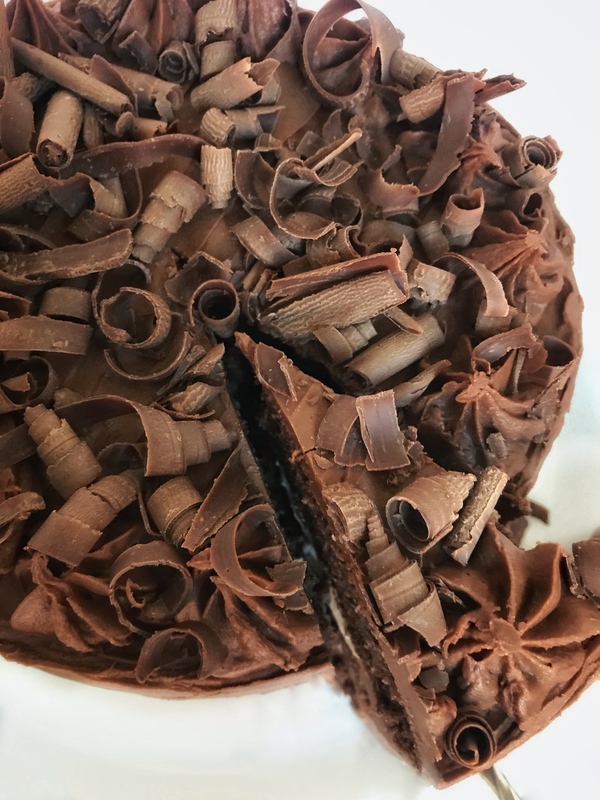 If you have extra frosting, you can pipe some swirls around the top edge of the cake before sprinkling on the shavings and curls. Setting the cake in the refrigerator for an hour (more is fine) helps set the frosting. It will be almost hard like fudge. It’s easiest to cut with a long, sharp, thin bladed knife to slice though the hard fudge exterior. Cut carefully, then serve. We hope you love it like we do! Cut parchment paper to fit 3 round cake pans (8 or 9 inch). Lightly grease pans, then lay down parchment rounds. Combine cocoa with boiling water in medium bowl, mixing with wire whisk until smooth; cool completely. Set aside. In a separate bowl, sift together flour, soda, salt and baking powder. Set aside. In a large mixing bowl, beat butter, sugar, eggs, and vanilla together with an electric mixer. Mix about 5 minutes until light and fluffy. At LOW mixer speed, beat in SMALL amounts of flour, alternating with cocoa mixture. DON'T OVER BEAT. Divide evenly in 3 pans. Smooth top. Bake 25 - 30 minutes or until surface springs back when gently pressed. Cool in pan 10 minutes, then carefully loosen sides with spatula and invert cake rounds on cooling racks. Let cool completely. Combine chocolate chips, cream and butter in a medium saucepan or double boiler, and stir over medium-low heat until smooth. Remove from heat. Blend in 2 1/2 cups of powdered sugar with whisk or electric mixer. (To speed up the process, you can set your bowl over ice as you whisk or beat it.) Beat until it holds its shape. Whip cream with sugar and vanilla until stiff peaks form. Refrigerate. On serving platter, place one layer, top side down. Spread with half of cream. Place second layer, top side down, spread rest of cream. Place third layer, top side up. Refrigerate at least 1 hour before serving. To cut, use a thin-edged sharp knife and slice with a sawing motion. I have the most success when I freeze the cake rounds before frosting. Once cakes are cool, line the 3 cake pans with plastic wrap. Insert cakes and cover with excess plastic wrap and foil. Freeze until hard. You can do this several days or even weeks in advance. This keeps the frosting from picking up cake crumbs as you ice the cake. To substitute a cake mix. I like Betty Crocker Triple Chocolate Fudge with this change: 1/2 cup sour cream; 3/4 cup water, 1/2 cup vegetable oil, 3 eggs. I also like Duncan Hines Devil's Food (a little darker chocolate) with this change: 1/2 cup sour cream, 1 cup water, 1/3 cup vegetable oil, 3 eggs. 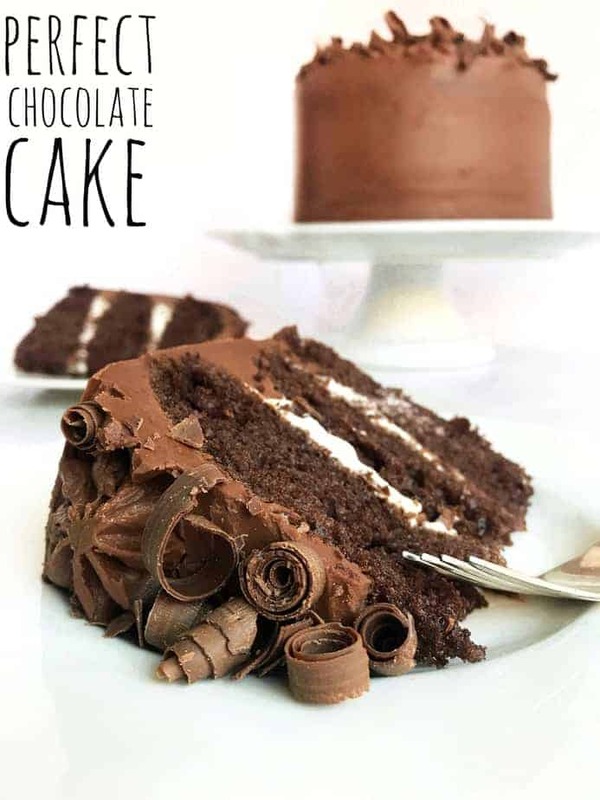 If you want an extra rich cake, spread a thin layer of frosting over each round before spreading the layer of whipped cream. Put your chocolate chips in the food processor with the chopping blade. Chop until chocolate is a fine powder. Melt your butter in a glass measuring cup, or other bowl/cup with a spout. Make sure the butter is all melted and SIZZLING hot! Turn on food processor with chocolate powder; quickly pour all the HOT butter through the feed tube. Let it run about a minute until chocolate is smooth. Add powdered sugar a little at a time. When it starts to get stiff, add the cream. You need to work quickly, as frosting will set up fairly fast, so start icing the cake asap.